Author contributions: He Q and Li G performed the majority of experiments; Li F performed the literature research; Zhan GQ and Li G performed the data acquisition and data analysis; Li G drafted the manuscript; Tan HB designed the whole study and reviewed the manuscript; all authors read and approved the final manuscript. Supported by Bureau of Public Health of Hubei Province. AIM: To explore the mechanism of action of gypenosides (GPs) on type 2 diabetes mellitus and non-alcoholic fatty liver disease (T2DM-NAFLD) in rats. METHODS: Sixty rats were randomly divided into a healthy group, an untreated disease model group and GP-treatment groups. The study involved the evaluation of biochemical parameters, including serum aspartate transaminase (AST), alanine transferase (ALT), blood glucose (BG), triglycerides (TG) and total cholesterol (TC). 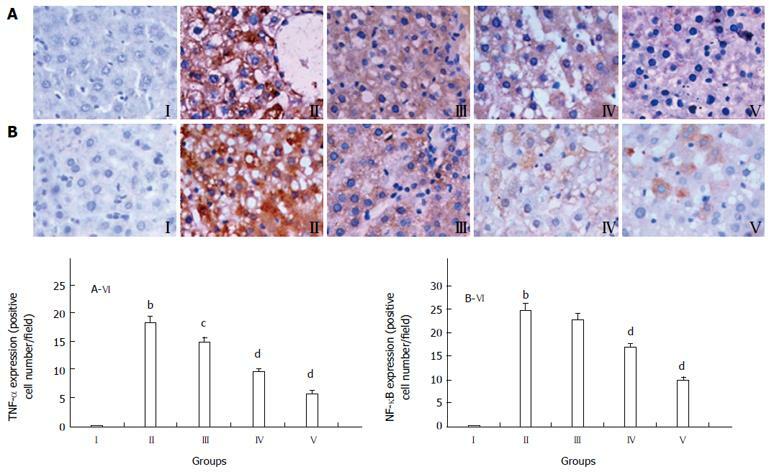 Additionally, the protective effect of the treatments were confirmed histopathologically and the expression of TNF-α and NF-κB in the rat liver was analyzed using immunohistochemistry. The expression of proliferator-activated receptor gamma (PPARγ) and cytochrome P450 (CYP450) 1A1 mRNA was determined by quantitative RT-PCR. RESULTS: GP treatments at oral doses of 200, 400, and 800 mg/kg per day significantly decreased the levels of serum AST and ALT (P < 0.05, P < 0.01), especially at the dose of 800 mg/kg per day. To a similar extent, GP at 800 mg/kg per day reduced the levels of BG (4.19 ± 0.47, P < 0.01), TG (80.08 ± 10.05, P < 0.01), TC (134.38 ± 16.39, P < 0.01) and serum insulin (42.01 ± 5.04, P < 0.01). The expression of TNF-α and NF-κB measured by immunohistochemistry was significantly reduced by GPs in a dose-dependent manner, and the expression of PPARγ and CYP4501A1 mRNA, as measured using quantitative real-time PCR, were significantly down-regulated by GPs. Moreover, GPs decreased the infiltration of liver fats and reversed the histopathological changes in a dose-dependent manner. CONCLUSION: This study suggests that GPs have a protective effect against T2DM-NAFLD by down-regulating the expression of TNF-α and NF-κB proteins, and PPARγ and CYP4501A1 mRNAs. Core tip: Gypenosides (GPs) are one of the most pharmacologically active components in G. pentaphyllum. Intervention with GPs significantly decreased the levels of aspartate aminotransferase, alanine aminotransferase, blood glucose, insulin, triglycerides and total cholesterol in type 2 diabetes mellitus and non-alcoholic fatty liver disease (T2DM-NAFLD) model rats, down-regulated the expression of TNF-α, NF-κB, rabbit anti-proliferator activated receptory (PPARγ) and rabbit anti-cytochrome P4501A1 (CYP1A1) mRNA, decreased the infiltration of liver fats and reversed the histopathological changes in a dose-dependent manner. These findings suggest that GPs have a protective effect against T2DM-NAFLD by down-regulating the expression of TNF-α and NF-κB proteins, and PPARγ and CYP4501A1 mRNAs. A long-term high fat diet is a risk factor for insulin resistance and type 2 diabetes mellitus (T2DM), which are characterized by elevated levels of serum free fatty acids (FFAs), declined oxidation of intracellular FFAs and increased fat accumulation in the target organs of insulin. Fat accumulation in the liver may result in non-alcoholic fatty liver disease (NAFLD). Currently, a large number of people showed excessive fat accumulation in the liver. NAFLD affects 20%-40% of the population, and approximately 30% of the patients with NAFLD progress to nonalcoholic steatohepatitis (NASH). NAFLD is the most common chronic liver disease, affecting both children and adults. It is closely associated with dyslipidemia, hypertension, insulin resistance, obesity[3-4] and other components of the metabolic syndrome[5-6]. Although the etiology of NAFLD is not clearly elucidated, the “two-hit” theory was popularly regarded as an underlying mechanism. In accordance, insulin resistance and its serious consequence have been indicated to be common conditions, which is frequently associated with the development of NAFLD. Therefore, insulin resistance is reported as an independent risk factor for NAFLD. The prevalence of T2DM is increasing worldwide and is projected to affect approximately 8% of the population by 2030[10,11]. T2DM and NAFLD (T2DM-NAFLD) are components of the metabolic syndrome, a cluster of interrelated clinical features including insulin resistance, dyslipidemia, hypertension, and visceral obesity. T2DM and NAFLD are major health issues associated with the worldwide epidemic of obesity. Insulin resistance plays a major role in the pathogenesis of T2DM-NAFLD and is considered a key factor in the initiation and perpetuation of NASH. Although several drugs are available to improve insulin resistance in diabetes, none are currently approved for NAFLD or NASH. Mohan et al found an overall prevalence of 32% NAFLD in the general population, but subjects with T2DM had a significantly higher prevalence of NAFLD while comparing subjects with normal glucose tolerance (22.5%) and those with impaired glucose tolerance (33.8%). Gynostemma (G.) pentaphyllum (Thunb.) Makino, called “Jiaogulan” in Chinese, is a perennial creeping herb that belongs to Cucurbitaceous family and is widely used in traditional Chinese medicine throughout Asia (China, Japan, Korea, etc.). Furthermore, G. pentaphyllum was brought into the list of functional foods by Ministry of Public Health of China on March 5, 2002, and several brands of herbal products based on G. pentaphyllum such as Jiaogulan tea and total Jiaogulan saponin tablets have been available in East Asian markets since the early 1990s. In traditional Chinese medicine, recent reports have shown that G. pentaphyllum exhibits a variety of biological effects, such as immunopotentiating, cholesterol-lowering, antitumor, antioxidant, anti-inflammatory, anti-hyperlipidemic, anti-hypoglycemic and cardiovascular effects. Gypenosides (GPs), the saponin extract derived from the herb G. pentaphyllum Makino, are believed to be one of the most pharmacologically active components in G. pentaphyllum. GPs primarily exist as dammarane type-triterpene glycosides (Figure 1). 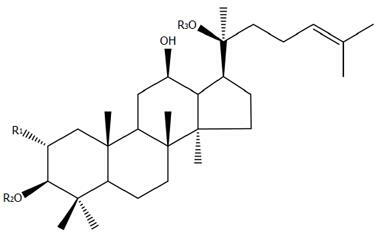 Recent pharmacological studies displayed that gypenosides had several pharmacological effects with wide clinical applications, including regulating lipid metabolism[19-20], anti-hyperlipidemia[19,21], anti-cancer[22-24], anti-inflammatory, anti-oxidative[26,27], anti-diabetic effects and hepatoprotection. Figure 1 General structure of dammarane-type gypenosides consisting of both the hydrophobic sapogenin part and the hydrophilic sugar part in the molecule (where R1 and R2 = glucose, rhamnose; R3 = glucose, xylose). Despite recent reports that GPs have therapeutic effects for certain diseases, the effect of GPs on T2DM-NAFLD is still unknown, to the best of our knowledge. The mechanism behind this protective action is not fully understood and published studies are currently lacking. Therefore, it is necessary to understand the mechanism of action of gypenosides. The present study was performed (1) to confirm whether gypenoside treatment in rats fed a high fat and sugar diet would decrease the expression of TNF-α, NF-κB and CYP4501A1 mRNA; (2) to investigate whether gypenoside treatment increased the activity of PPARγ; and (3) to test whether these changes were accompanied by a decline in lipid accumulation and blood sugar in the rat liver and serum. Alanine aminotransferase (ALT), aspartate aminotransferase (AST), blood glucose (BG), insulin, triglycerides (TG) and total cholesterol (TC) kits were purchased from Nanjing Jiancheng Bioengineering Institute (Nanjing, China). Protein assay kit was purchased from Zhongshan Institute of Biotechnology (Beijing, China). Mouse anti-TNF-α, mouse anti-NF-κB, rabbit anti-proliferator activated receptory (PPARγ), rabbit anti-cytochrome P4501A1 (CYP1A1), horseradish peroxidase-conjugated goat anti-rabbit IgG, goat anti-mouse IgG and mouse anti-glyceraldehyde-3-phosphate dehydrogenase (GAPDH) antibodies were obtained from the Proteintech Group, Inc. (Chicago, United States). FITC-conjugated goat anti-rabbit IgG was obtained from Zhongshan Institute of Biotechnology (Beijing, China). Gypenosides (> 98%) were obtained from Xi’an Tianfeng Biotechnology Co., Ltd. Streptozotocin (STZ) was obtained from Sigma (United States). The high fat and sugar diet (83.25% basic feed + 10% lard + 5% sugar + 1.5% cholesterol + 0.2% sodium deoxycholate + 0.05% prothiopyrimidine) was prepared in our lab. Male Sprague-Dawley rats weighing 180 to 200 g were purchased from the Experimental Animal Center of Hubei University of Medicine, China. Six rats were placed in a cage on a 12 h light/dark cycle and quarantined for one week before the experiments. All animals were maintained under controlled conditions (temperature: 24 °C, humidity: 45%, free access to water and food) and received human care according to the National Institutes of Health Guidelines of China and related ethical regulations of Hubei University of Medicine. All the animals were fasted for 12 h before the sample harvest. After acclimatization for one week, 60 rats was randomly allocated into two groups: a normal group (group I, n = 8), which was raised with normal feed; and a model group (n = 52), which was raised with high fat and sugar feed (HFSD: 83.25% basic feed + 10% lard + 5% sugar + 1.5% cholesterol + 0.2% sodium deoxycholate + 0.05% prothiopyrimidine), injected with 40 mg/kg STZ overnight for 4 wk, and continued to be fed the same HFSD for the next 4 wk. From the 9th wk, the survival rats in the model group were further randomly divided into a model group (group II) and three GP-treatment groups (groups III IV, and V), which were given GPs at doses of 200, 400 and 800 mg/(kg.d), respectively, with 12 rats in each group. GPs were administered orally and the animals continued to be fed the HFSD for 6 wk, as previously described. Blood samples of all experiment rats were obtained through the orbital venous plexus at the end of the experiment. The fresh liver was taken and weighed to calculate the liver index [liver index (%) = liver weight/body weight × 100%]. The right liver lobe was fixed in 10% formalin for histopathological and immunohistochemical assays. The rest of the liver and blood samples were stored at -80 °C for other biochemical assays. Measurement of serum biochemical markers: Serum was obtained from the blood after centrifugation at 2500 g for 5 min. The levels of AST, ALT, BG, TG and TC in serum were detected with an Olympus AU2700 Autoanalyzer (Olympus, Tokyo, Japan) by using commercial kits. The oral glucose tolerance (OGT) test was conducted using the modified Li’s method. BG was detected with an Accu-Chek Active Blood Glucose meter (Roche, Ireland), and the blood was collected 0, 30, 90 and 120 min from the tail vein of rats after the administration of high-dose glucose. BG levels were plotted and the OGT levels were quantified by the area under the curve (AUC) analysis. Rat liver specimens were fixed overnight in 10% formaldehyde, routinely embedded in paraffin, and cut into 5 μm thickness. The slices were stained with hematoxylin-eosin (HE) for routine histopathological examination, then examined and imaged using a light microscope (Olympus BX-50 Microscope, Leica Microsystems, Germany) at × 200 magnification for the degree of hepatic steatosis. The formalin fixed and paraffin embedded liver sections (5 μmol/L) were mounted on glass slides. The slices were deparaffinized and incubated in 3% H2O2 for 10 min to quench endogenous peroxidase activity. Then the slices were stained with monoclonal mouse anti-TNF-α or mouse anti-NF-κB antibody at 4 °C overnight, respectively, after 20 min of normal goat serum blocking. Incubation with a secondary antibody (horseradish peroxidase-conjugated goat anti-mouse antibody) at 37 °C for 30 min was then conducted. Finally, the antibody binding was visualized through incubation with DAB-H2O2 at room temperature for 10 min. Images were taken at × 400 original magniﬁcation (Olympus BX-50 Microscope, Leica Microsystems, Germany). Following the manufacturer’s instructions, total RNA was extracted from the liver tissues from each of the groups I, II, III, IV and V, using RNAiso Plus reagent. Total RNA (2 μg) was reverse transcribed into cDNA using StarScript II First-strand cDNA Synthesis Kit with a C 1000 PCR system (Bio-Rad, United States). The levels of mRNA expression were quantified by real-time PCR with StarScript II SYBR Two-Step qRT-PCR Synthesis Kit and CFX 385TM Real Time PCR System (Bio-Rad, United States). Primers sequences were as follows: PPARγ: forward, 5’-GGAGCCTAAGTTTGAGTTTGCTGTG-3’; reverse, 5’-TGCAGCAGGTTGTCTTGGATG-3’, (GenBank: NM_0131-24.3) and CYP4501A1: forward, 5’-CTGGTTCTGGATACCCAGCTG-3’; reverse, 5’-CCTAGGGTTG GTTACCAGG-3’ (GenBank: HO_0047-97.1). GAPDH gene, used as an internal control, was amplified separately to normalize gene expression in samples. Fold change between group I and groups II-V was calculated by the 2-ΔΔCt method. Data are expressed as mean ± SD, and all the data were analyzed by one-way analysis of variance. Dunnett’s t-test was used to calculate statistical significance using SPSS software. P-values < 0.05 were considered statistically significant. After 8 wk HFSD feeding, the body weight of rats in groups II-V was significantly increased, compared with the normal rats in group I (Figure 2A). However, the body weight gain in groups III-V was lower than that in the model group (group II), after GP (200-800 mg/kg) treatment for 6 wk. Thus, treatment with GP could possibly inhibit the obesity occurrence in the HFSD treated group. Consistent with these findings, the liver index was reduced markedly in the GP-treated groups (P < 0.01 or P < 0.05, Figure 2B). Figure 2 Effects of gypenosides on body weight (A) and liver index (B). bP < 0.01 vs group I; cP < 0.05, dP < 0.01 vs group II. The activities of serum ALT and AST were used as biochemical markers for early acute liver injury. As shown in Table 1, compared with the normal group, the levels of serum AST and ALT were increased significantly in the model group (P < 0.01). While compared with the model group, the levels of AST and ALT significantly decreased in GP pretreatment groups (200, 400 and 800 mg/kg) in a dose-dependent manner (P < 0.05 or P < 0.01). Table 1 Effects of gypenosides on serum alanine transferase and aspartate transaminase levels in high fat and sugar feed-induced type 2 diabetes mellitus and non-alcoholic fatty liver disease rats. The serum levels of aspartate transaminase (AST) and alanine transferase (ALT) were measured in the following groups: group I, normal control; group II, model; group III-V, 200, 400 and 800 mg/kg of GPs, respectively. The data are expressed as mean ± SD (n = 12) in each group. dP < 0.01 vs group II. In Table 2, compared with the model group, the concentrations of TC and TG in the blood significantly decreased in a dose-dependent manner in GP treatment groups (P < 0.05 or P < 0.01). Moreover, the levels of glucose in blood were obviously decreased after pretreatment with GPs, especially the group of 800 mg/kg (4.19 ± 0.47, Table 2). Further research demonstrated that the level of insulin was lower in groups III-V than in group II (Table 2), and GPs at 800 mg/kg significantly decreased the AUC0-120 min of the OGT test (P < 0.05) (Figure 3A, B). These observations indicated that GPs had significant lipid- and glucose-lowering effects in T2DM-NAFLD. Table 2 Effects of gypenosides on the levels of total cholesterol, triglycerides, blood glucose and serum insulin in the blood of high fat and sugar feed-induced type 2 diabetes mellitus and non-alcoholic fatty liver disease rats. The serum levels of total cholesterol (TC), triglycerides (TG), blood glucose (BG) and serum insulin were measured in the following groups: group I, normal control; group II, model; group III-V, 200, 400 and 800 mg/kg of GPs, respectively. The data are expressed as mean ± SD (n = 12) in each group. Figure 3 Effects of gypenosides on blood lipid and glucose levels. 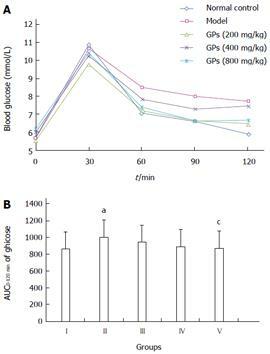 A: Oral glucose tolerance: the blood glucose levels were measured before the glucose challenge; B: The area under the curve (AUC 0-120 min) after 30, 60, 90 or 120 min challenge was calculated and analyzed. (I) normal control, (II) model, (III) gypenosides (GPs) (200 mg/kg) + HFSD, (IV) GPs (400 mg/kg) + HFSD, (V) GPs (800 mg/kg) + HFSD. The values are expressed as mean ± SD in each group. aP < 0.05 vs normal control, cP < 0.05 vs model; n = 12. Observed with naked eyes, the livers from the normal control group (Figure 4A I) were deep red, glossy, moist and resilient. While in the model group (Figure 4A II), the livers lost luster, enlarged and had yellow necrosis foci on the surface. 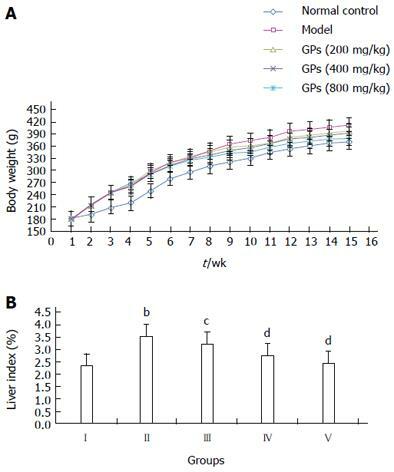 Furthermore, liver injury in the GP pretreated rats was mitigated dramatically in a dose-dependent manner (Figure 4A III-V). Figure 4 Appearance of the liver (A) and histopathological examination using hematoxylin and eosin staining (B) (HE, × 200 magnification). (I) normal control, (II) model, (III) gypenosides (GPs) (200 mg/kg) + HFSD, (IV) GPs (400 mg/kg) + HFSD, (V) GPs (800 mg/kg) + HFSD. HFSD: High fat and sugar diet. HE stained sections are shown in Figure 4B. In the normal control group (Figure 4B I), the histology of the liver displayed that a normal, clear and regular liver lobular architecture, a single layer of hepatocytes around the central vein and abundant basophilic granular cytoplasm in the hepatocytes. Whereas the livers from the model group (Figure 4B II) exhibited severe widespread lipid vacuoles inside the parenchyma cells, centrilobular liver necrosis and infiltrating lymphocytes. Treatment with GPs prevented the histopathological changes and mitigated microvesicular fatty changes, especially treatment with a high dose of GPs (800 mg/kg) (Figure 4B V). Different degrees of TNF-α expression could be seen in the damaged liver tissues. The normal control group showed minimal TNF-α expression (Figure 5A I), whereas all experimental groups exhibited increased expression of TNF-α, especially in HFSD-induced group (Figure 5A II). Furthermore, the TNF-α expression decreased in the GP (200, 400 and 800 mg/kg) pretreatment groups, although it was still higher than that in the normal group (Figure 5A III-V). The quantiﬁcation of TNF-α stained cells is showed in Figure 5A VI. The data are expressed as mean ± SD of 12 mice. Figure 5 Representative photographs of immunohistochemical examination (× 400 magnification). A: TNF-α; B: NF-κB. (I) normal control, (II) model, (III) gypenosides (GPs) (200 mg/kg) + HFSD, (IV) GPs (400 mg/kg) + HFSD, (V) GPs (800 mg/kg) + HFSD, (VI) Quantiﬁcation of TNF-α and NF-κB stained cells. Data are expressed as mean ± SD of 12 rats. bP < 0.01 vs normal control; cP < 0.05, dP < 0.01 vs model. In Figure 5B, the normal liver tissue expressed the lowest amount of NF-κB (Figure 5B I). The HFSD-intoxicated group showed significantly higher expression of NF-κB, compared with that in the controls (P < 0.01) (Figure 5B II). The GP (200, 400 and 800 mg/kg) treatment markedly decreased the NF-κB expression (Figure 5B III-V). The quantiﬁcation of NF-κB stained cells is showed in Figure 5B VI. The data are expressed as mean ± SD of 12 mice. To study the mechanisms of the action of GPs against T2DM-NAFLD, their effects on the expression of PPARγ and CYP4501A1 mRNAs were examined (Figure 6). 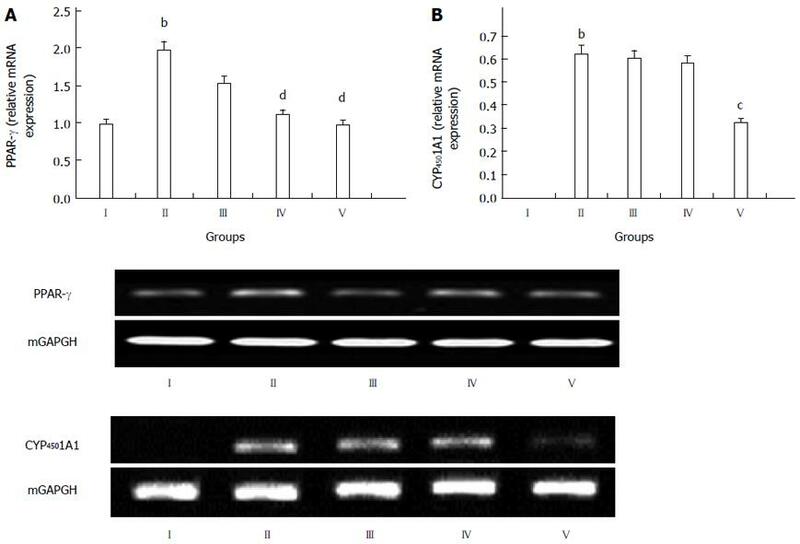 It was obvious that the GP treated groups showed significantly reduced levels of PPARγ, compared with the model group (P < 0.01, Figure 6A), especially group V.
Figure 6 Effects of gypenosides on the gene expression in the liver tissue of high fat and sugar feed treated rats. A: Rabbit anti-proliferator activated receptory (PPARγ); B: Rabbit anti-cytochrome P4501A1 (CYP1A1). (I) normal control, (II) model, (III) gypenosides (GPs) (200 mg/kg) + HFSD, (IV) GPs (400 mg/kg) + HFSD, (V) GPs (800 mg/kg) + HFSD. The values are expressed as mean ± SD in each group. bP < 0.01 vs normal control; cP < 0.05, dP < 0.01 vs model, n = 12. In Figure 6B, compared to the normal control group, the expression of CYP4501A1 mRNA was significantly up-regulated in the model group (P < 0.01, Figure 6B). The expression of CYP4501A1 mRNA was down-regulated in the GP-treated groups, compared with the model group, especially the high dose group (800 mg/kg) (P < 0.05, Figure 6B). In the present study, T2DM-NAFLD model was established by oral administration of a high fat and sugar diet to rats. As a result, obesity, hyperlipemia and insulin resistance were caused by HFSD, which are the most common risk factors for the development of NAFLD. The liver injury demonstrated the formation of NAFLD. Thus, HFSD administration is a reasonable way to induce T2DM-NAFLD, which is similar to that observed in clinical practice. Currently, rational diet, exercise and medicines (metformin, statins and fibrates) are the main methods for treating NAFLD. However, up to now, these methods are not the effective way for treating NAFLD. The drugs in the current market have always adverse effects or contraindications, and there is still no consensus on the most effective drug therapy. Therefore, it is necessary to develop new drugs for NAFLD treatment with little or no side effects. Saponins are believed to be the major components of several folk medicines or natural plant drugs, and they are the natural glycosides of triterpene or steroid, which displayed several different pharmacological or biological effects. Moreover, saponins are regarded as responsible for numerous pharmacological properties. Notably, saponins can regulate the immune system of animals, and currently, they have led to a significant interest in their potentials as vaccine adjuvants. In the present study, the results indicated that HFSD administration increased hyperlipemia, insulin resistance and obesity, whereas GP administration significantly decreased hyperlipemia and blood glucose. Furthermore, pretreatment with GPs ameliorated serum insulin levels in this study, due to their strong anti-hypoglycemic and anti-hyperlipidemic abilities. As a result, GPs reduced liver injury and protected the liver against T2DM-NAFLD. TNF-α is a major proinflammatory cytokine and plays an important role in the development of HFSD-induced T2DM-NAFLD. Kupffer cells are the major population of the monocyte macrophage lineage in the liver and TNF-α is produced predominantly by this lineage. Thus, activated Kupffer cells can increase the production of TNF-α, which may be responsible for NAFLD. Current studies have exhibited that TNF-α inhibition could decrease the level of hepatic fatty storage in the HFSD-treated mice. In this study, the effects of TNF-α were evaluated by immunohistochemistry in the damaged liver. The HFSD treatment up-regulated the expression of TNF-α, compared with the control group, whereas pretreatment with GPs down-regulated the expression of TNF-α, compared with the HFSD-intoxicated group. PPARγ is a member of the nuclear hormone receptor superfamily, which is located on chromosome 3p25 and encodes a nuclear transcription factor involved in the expression of hundreds of genes. PPARγ increases the expression of lipoprotein lipase, which is an enzyme that serves to partition fat to adipocytes, limiting fatty acid flux to the liver. In this study, compared to the model group, the expression of PPARγ was significantly down-regulated in the GP treatment groups, which indicated that the protective mechanism of the GPs may be related to PPARγ. CYP450 isoform 1A1 has been shown to be one of the most potent microsome cytochromes to generate ROS. Liver CYP450 1A1 is accepted as the hallmark of oxidative stress. In previous studies, it has been shown to be invariably elevated in the liver of NASH patients. In this study, we further observed elevated CYP450 1A1 expression in the HFSD group and significant down-regulation of its expression in the group treated with a high dose of the GPs. In conclusion, 6 wk of oral GP administration improved lipid profiles, significantly decreased serum levels of AST, ALT, BG, TG and TC in the T2DM-NAFLD model rats, down-regulated the expression of TNF-α and NF-κB proteins, and PPARγ and CYP4501A1 mRNAs, decreased the infiltration of liver fats and reversed the histopathological changes in a dose-dependent manner. Our investigation provided convincing data that support the potential hepatoprotective effects of GPs. Gypenosides, the saponin extract derived from the herb G. pentaphyllum Makino, are believed to be one of the most pharmacologically active components in G. pentaphyllum. Recent pharmacological studies displayed that gypenosides had several pharmacological effects with wide clinical applications. In the present study, the authors investigated the mechanism of gypenosides on type 2 diabetes mellitus and non-alcoholic fatty liver disease (T2DM-NAFLD) in rats. Despite recent studies, which reported that gypenosides have therapeutic effects against certain diseases, the effect of gypenosides (GPs) on T2DM-NAFLD is still unknown. Additionally, the mechanism behind this protective action is not fully understood. Published studies, however, are currently lacking. Therefore, it is necessary to explore the mechanism of action of gypenosides. The present study first reported the mechanism of action of gypenosides on T2DM-NAFLD in rats. This study was very useful to establish the efficacy of gypenosides as a potent T2DM-NAFLD drug. T2DM-NAFLD is a major health issue associated with the worldwide epidemic of obesity. At present, many studies about T2DM-NAFLD drug are focused on the traditional Chinese medicines, which have been used in China for thousands of years. This is an interesting study assessing the effects of “GPs” in a rat model of T2DM-NAFLD. The results are interesting and suggest that gypenosides have a protective effect on T2DM-NAFLD through down-regulating the expression of TNF-α and NF-κB proteins, and rabbit anti-proliferator activated receptory (PPARγ) and rabbit anti-cytochrome P4501A1 (CYP1A1) mRNAs.